All vaccinations up to date, microchipped and passported. Quiet, sensible dressage horse with much ablity. 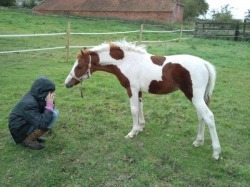 She is a quick learner and easily trainable with good paces. Safe hack alone or in company and is a willing jumper. Happy to be ridden astride or aside. Sadly for sale as para rider is no longer able to carry on. 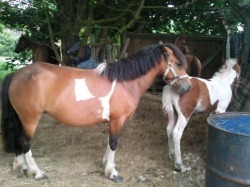 Beautiful yearling coloured filly foal,to make around 12hh-12.2hh , chipped and registered with WPCS-PB also eligible AHS-PB.She is a fantastic show prospect, having the most gorgeous coloured markings and a lovely floaty action. She is by the stunning coloured part-bred Arab stallion Apache Teen Spirit out of a little coloured Dartmoor Hill pony and has such a sweet nature. She has been well handled since birth and is tame !! Please contact Heidi on 07887532463 for more information . 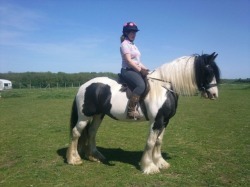 15.2hh Coloured Cob 8yrs, This lovely Mare, originally from Ireland but reg with Weatherby's non TB, is such a useful type of horse. She has the most comfortable paces ever and also loves to jump. 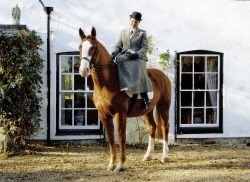 She can be safely ridden by everybody, from tiny teenage girls to creaky old ladies and would most likely be brilliant out hunting next season. Absolutely fantastically safe with all types of traffic. Lady lives out all year round quite happily without even needing to be rugged up, although this does mean that at the moment she is a little wild n woolly in appearance !! 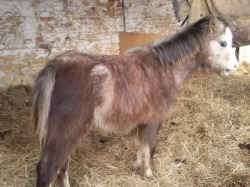 She has great potential in the Show Ring or for being a Faithful Family Friend and is on the market for £3.500, do not hesitate to contact me, Heidi, on 07887532463 for more details.I am only selling this Cracking Cob to raise funds for the purchase of a lorry so my daughter can compete again, so I would not wish to consider loaning her out - however good the home may be - Sorry . Will be ready to BE,April/May time. Jumping 1.10m at home will go a lot further. Three superb paces,always gaining nice comments from the judges. Lovely cheeky chap,to handle on the ground. Current owner holding him back as lacks the time with college and work commitments. £4500 ono with all tack and rugs included. 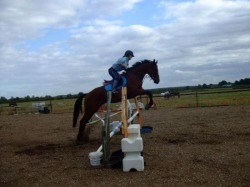 Plume is approx 16.1hh reg tb mare 10yo she is ridden in a happy mouth snaffle, she has previously hunted. Hacks out alone or in-company, good to catch box, farrier, in traffic etc. Plume likes to jump but is one to be ridden into her fences - she has alot of potential over fences and would make a fab competetion horse. Plume will live out with a shetler and a warm rug in the winter months, she does crib but it can be cured with a collar, and this is reflected in her price. She does have a loving nature and always tries her best to please. £995 ono - delivery, tack, and rugs available at an extra cost. 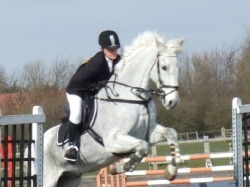 super competition pony sj, xc and dressage qualified for frys twice with previous owner. Has done trailblazers at 80 cm and 1 m with scope to do more, done pony club including sj teams been placed on numerous occasions at xc up to intermediate level and sj to open level. 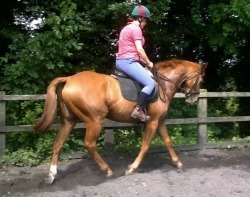 good to hack, catch farrier only for sale as rider outgrown £4500 inc tack and rugs ono. 17hands, 7year old, bay holsteiner gelding. Pink papered. Fantastic pases, super attitute/temperament. 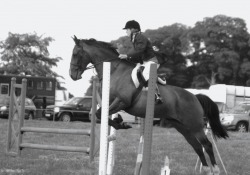 He has competed at both intro and pre-novice, winning the intro class at Draycott House. Careful bold scopey jump. Clear xc, dressage always low 30's. SJ 1.10m with ease. Competed in all riding club/pony club teams. Hacks alone/company. Good to shoe/box/clip etc. No vices. Easy to do in all ways. 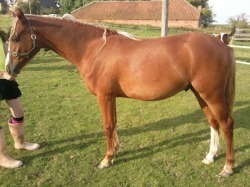 Very sad sale of this much loved horse due to owners illness. Will not pass a 5*stage vetting. Two saddles (wintec 500 dressage and ideal impala) plus full wardrobe available.